Walking down a long, grey ramp into the aircraft hangar at Duxford near Cambridge, the B-17 Flying Fortress was parked up just to the left. Inspiring and sobering, it is a huge plane, ahead of its time and bristling with guns. Yet the crew would all have been so vulnerable: the pilots peered out through Plexiglas, the rear gunner sat wholly on his own at the back unable to wear a parachute and the Ball Turret Gunner was in a bubble underneath the plane. In fact, of the 12,000 B-17’s flown in WWII, 4,000 never returned. We were filming with the BBC, picking up a story from a book I wrote about Highclere and World War Two. Eight planes went down here on the Estate during World War Two and, as a result, I now “own” a few remains of a B-17. From the burnt twisted metal, to a recognisable pot of Brylcreem and some jacket buttons, I am effectively looking at the tatters of men’s lives, very conscious of the grief of their families. Earlier this year I wrote a fun April Fool’s spoof blog, which led via “Star Wars” to the discovery of the airmen’s relatives. Since then, we have welcomed families of some of those on the planes that crashed here which has been so positive and uplifting. The next stop after Duxford was the American Cemetery near Cambridge where two of Highclere’s US airmen now lie: Jake Buikema and Robert Sprout. Immaculate rows of carved white crosses, beautiful autumn trees, views and words. 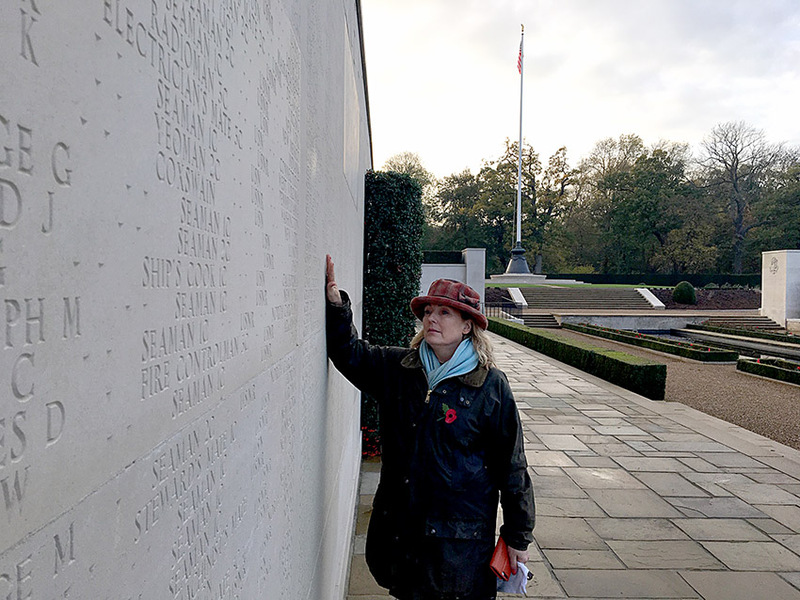 Just as in the First World War, thousands of names of men, of brothers, sons and fathers, are carved into a wall of Portland stone because they sleep in unknown graves. They include Glen Miller, the famous big band leader, and Joseph P Kennedy. As we stood in the Cemetery, a lone Spitfire flew over our heads, paying its own respects to those below. 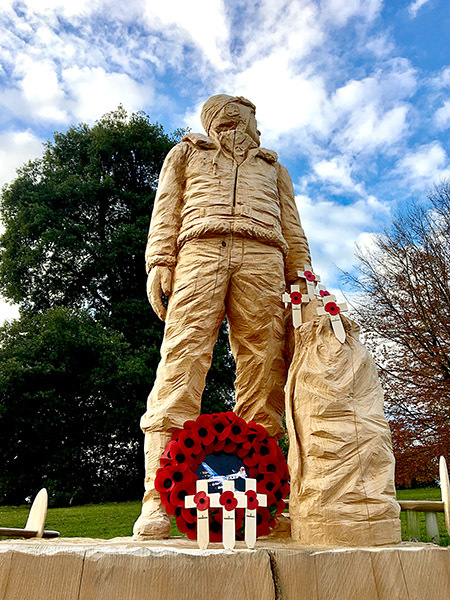 It is now two months after our ‘Heroes at Highclere’ event and the unveiling of our cedar memorial to the airmen who were lost here. 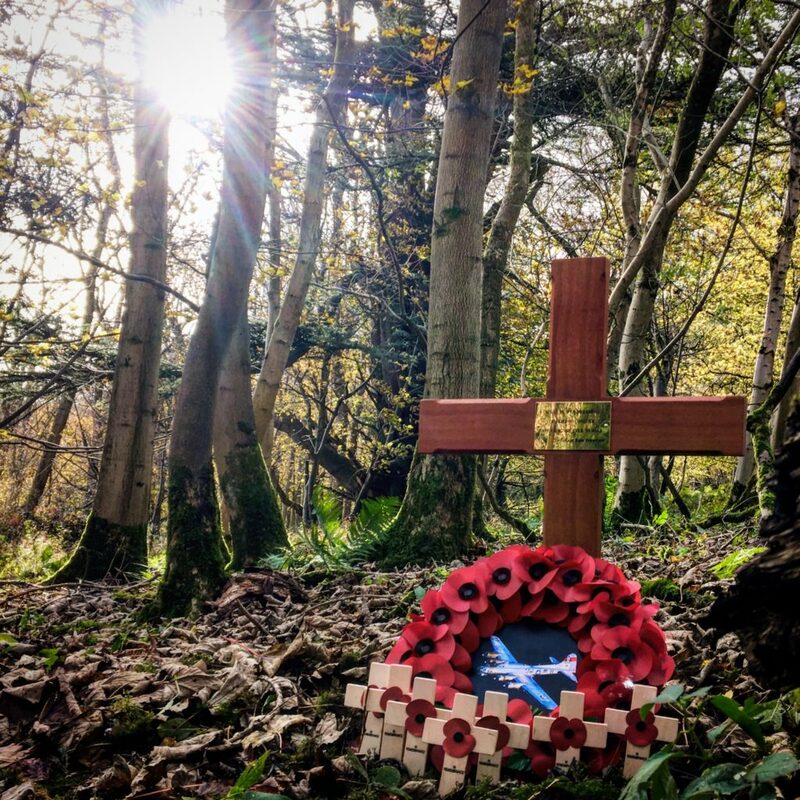 We have returned to Siddown Hill above the Castle to mark the crash site of the B-17 with a cross, with a wreath and a plaque to remember them. One of my most prized books is the letters of Wilfred Owen which Geordie gave to me. He and all the other war poets left us such a body of poetry which remains hard to read, to feel for the undone years. 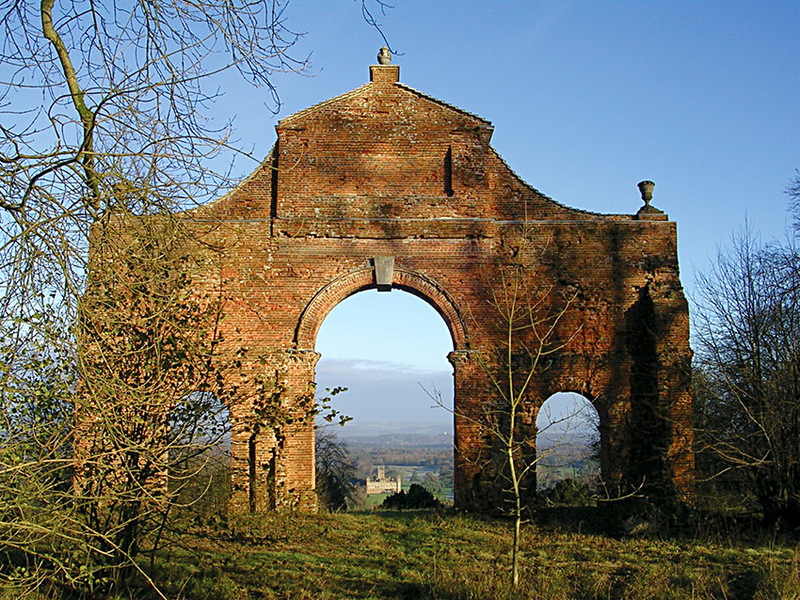 I sometimes feel that so many stories and lives are held in the books, letters and landscapes here at Highclere. Yet our home is also a monument to man’s creativity, energy and long term vision. We are able to live in such a beautiful environment due to the courage of those who fought and of those who survived. Our ethos here is remember to say thank you, to serve in the memory of those who died , and to strive for reason and peace. In a small way, to be able to sit together at a table and share food, wine and conversation. Beautifully written as always, thank you for sharing these important facts and feelings. We shall never forget. I was there in June of this year and saw the carving underway. It is beautiful. Thank you so much for sharing it. My four hour tour at Highclere was a highlight of my life. I am anxious to return. Your books have brought me such joy as I was introduced to the families that lived there. I was struck by the gratefulness of your citizens when they discovered we were American visitors. They were anxious to point out the memorials you country has kept to remind them of our role in the two wars. I was humbled and appreciative on behalf of my dad and my father-in-law, a bull turret gunnar and a navy pilot respectively. Thank you, Lady Carnarvon, for sharing. Thanks all those who have and are serving to keep our world safe from those who insist that they are the only ones who are right. A man rarely realizes how deep his feeling are about why he went to war,, until someone realizes that he never return from that war !! Thank you for your kind remembrance. It helps keep the flame alive. Thank you also for including Americans in your narrative. Thank you for this column and photos today. It was sad but also uplifting in a way. I shall get the Wilford Owen book. His poems are outstanding and the letters so interesting. Geordie found it and bought it for me whilst I was writing “Almina”. some other men from Wilfred Owen’s regiment came to Highclere but not the soldier poet himself. I have just finished reading your book about Highclere and the real Lady Almina and this blog beautifully ties all of the history together. I’m sure the book was a lot of work, considering all the research you did, but I never tire of hearing the stories of the brave and dedicated men and women of WWI and WWII and the role that Highclere played in so many peoples’ lives. Thank you. Thank you for the beautiful and heartfelt tribute to all the brave men and women who lost their lives in WW1. I bought a poppy necklace from your gift shop in 2014 whilst I was there for Heroes at Highclere Day and wore it proudly yesterday. . I also have one of the 888,246 poppies from the Tower of London exhibition. I took it to my church yesterday, placing it on the altar, here in Phoenix, Arizona. Our Pastor talked about the poppy during the children’s sermon and its significance. My mother, who sadly had dementia, but remembered the night 1,000 B 17’s flew over Grimsby, on the way to bomb Germany. A soldier of the Great War known unto God. Thank You very much for this lovely tribute to those who gave the ultimate sacrifice. And a Thank you to all the Veterans. Thankmyou for your beautiful words, Lady Carnarvon. My Uncle Bobby, Robert Eldridge Connor, Jr. was a member of the Army Air Corps in WWII. Fortunately, he came back to Texas alive. I recently found some of his medals, including a Purple Heart and a letter commending him for having had to bail out of his plane with a parachute. Such brave souls! Thank you for honoring them. I am glad he made it out! A most fitting tribute of remembrance. Your mention of Duxton and Cambridge brought back memories of the Eagle Hotel in Cambridge with its famous rear bar where so many airmen signed their names on its ceiling. (The Eagle also is where Crick and Watson announced they had discovered the structure of DNA in 1953.). The “RAF Bar” at the Eagle is a “must see” location for anyone visiting Cambridge. Very moving too. I also wholeheartedly agree with your reference to inspiring sentiments on places of remembrance (and elsewhere). The Australian National Memorial at Villers-Bretonneux, France is the main memorial to Australian military personnel killed on the Western Front during World War I. It was unveiled on 22 July 1938 by King George VI, whose words were broadcast directly to Australia. On 24 April 1918, Villers-Bretonneux was the site of the world’s first battle between two tank forces: three British Mark IVs against three German A7Vs. The Germans took the town, but that night and the next day it was recaptured by two brigades of the First Australian Imperial Force at a cost of approximately 1,200 Australian lives. From that day the towns people of Villers-Bretonneux have had a firm bond and great fondness for all Australians. The expression of that town’s sentiments is not confined to the War Memorial. “N’Oublions Jamais l’Australie” (Let us never forget Australia). The Centenary commemoration of Armistice Day last Sunday has quite properly focused attention on the many who made the ultimate sacrifice. Thank you for the moving reminder that we share an indelible bond and a common desire for reason, peace, and community. So eloquently put “strive for reason” – the best tribute we can give is to remember them and live the life they left us to the best of ourselves. I am trying to be kind and pay it forward…..thanks again for a sad but uplifting chapter. Thank you, Lady Carnarvon, for your beautiful and poignant words of remembersnce! My family has served the cause of freedom for the last four generations, and even my own son served after 911. We are so glad to see the appreciation for the sacrifices made by those who served and continue to serve today! What a beautiful and inspiring memorial blog. Thank you so much for mentioning the airmen lost from the U.S. on this our weekend celebrating our veterans. You inspire with your words and memories of yesterday, as you bring hope for the world we live in today. Thank you and then part of my thought with “Heroes” was practical! Thank you for all the work you do to bring history alive, to make connections to other countries and other times, and to share your knowledge and love of history with others. Remembering all of those who served along with the UK. Greetings from an island off the west coast of Canada where many Remembrance Day ceremonies occurred yesterday. 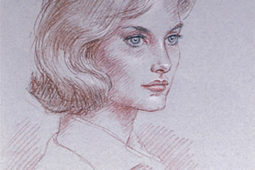 Thank-you for your heartfelt remembrance in both words and images, Lady Canarvon, they are much appreciated. I was fortunate enough to be in the UK on extended leave and to witness the Armistice Day commemorations held at a number of venues on 11 November this year. The sand portrait of Wilfred Owen’s piercing gaze on Folkestone beach was especially poignant, as the tide moved in and slowly washed his features from the shore. A reminder that time ran out for so many, and that too few returned home after the guns fell silent in WW1. Thank you for all the work you do to bring history alive, to make connections to other countries and other times, and to share your knowledge and love of history with others, and remembering all of those who served along with the UK. Greetings from an island off the west coast of Canada where many Remembrance Day ceremonies occurred yesterday. As I sit here in tears reading this beautiful remembrance, again I want to thank you, Paul, Steve & all involved in memory of our Airmen. My father was so proud of his brother Jake, he instilled it in me and my son. My grandmother’s diary & Uncle Jakes letters, read over the years…. You and your team have answered so many questions. I also hope you know the wonderful friendships that have been made by your generosity through the Heroes at Highclere. Big thank you for visiting our Jake, Lt Sprout and all at the American Cemetery. The memory of these Airmen will live on thanks to you and your team. The Cemetery was so beautiful and I was so glad we went It has, on our part, been an honour to reunite your family to your story. Yesterday as a family we remembered my Great Uncle Private George Lyon, a Barnsley Pal, killed on the first day of The Somme 01/07/1916. A generation lost, but who also left families behind to deal with the grief of such tremendous loss. I write “Almina” and cried through the First War sections and was so drained by 1918 I found it hard to express the next chapter, 1919. Yet they did. Thank you for honoring and remembering and sharing. A clarification to my post regarding my mother remembering the B 17’s flying over Grimsby, that was WW2. Not WW1. Thank you – understood ! A late friend of mine was a tail gunner on a B-17 that flew 11 missions over Germany. He came from a farm family that lived on a dirt road here in North Florida. A few years back, I was honored to accompany him to an air show which had a B-17 on display. As we entered the flight deck and walked (crawled) towards the tail gunner section of the aircraft, he began to cry. “Its seems like yesterday when me and the crew were flying almost 12 hour missions and nearly freezing to death in this aircraft. I wonder were they are today”. They were truly the “Greatest generation”. Thank you for remembering all those who paid the ultimate price. Beautiful tribute. May we always remember their great contributions and sacrifice! These wonderful memories keep them alive in our hearts. Thank you! Beautiful pictures and comments, thank you Lady Carnarvon for your tribute to our heros of WWI, WW2 and all the Wars our brave soldiers have fought in. I had 2 Uncles who fought in France in WWI and 2 Uncles who fought in WW2. Thanks be to God, they all made it home! Beautifully written as always. Thank you for remembering those who gave the ultimate sacrifice for freedom. Thank you for your beautiful remembrance and uplifting reminder that the cost of freedom is not free! It has been such an extraordinary journey! I have been in tears all weekend watching the moving commemorations there in Britain and also over here. In Kansas City, Missouri, our World War I Memorial erected in 1926, held a commemoration, too. Somehow, your English commemorations are so poignant because it was your soil upon which these brave souls fell. We must never forget and continue to carry the torch for freedom. Thank you so much for sharing your eloquent words. Thank you for your lovely tribute. Brought tears to my eyes. My wife Dianne (who is British met you in 2014 so we feel a special ” kinship ” to Highclere. We Americans are always here for you (even if a little late sometimes). I’m proud to be an American and also proud to be an English descendent. From Phoenix Arizona . What a beautiful memorial. Bless you for your consciousness. My father-in-law was not able to serve due to a damaged ear drum however was very proud to have worked in the factory here in New York that manufactured parts of the famed WWII mosquito bomber for assembly in Canada. He remembers the day they did a fly over the factory for the workers to see the finished product. It was thrilling. Can you imagine a plane made of plywood? I think all pilots have the toughest most courageous job in the world. Comrades in purpose is a great force. Yesterday was our Veteran’s Day observance honoring survivors and those currently serving. Many of our eateries offer free coffee, breakfast, and lunch. Also discounts on other services. Nice to know we can salute the brave still able to enjoy life in freedom and success. You are a genuinely good person. I believe most of us are!!! They gave so much! I hope that we never stop honouring these brave souls. Without them, our world would have turned out very differently. We must never forget the sacrifice they made. I agree – we still need to learn history and from that comes understanding – I am always keen to help raise funds for such endeavours when I am in the US. I think it is a bigger part of history here than over the sea! Thank you so much for your personal account of England’s part in World War ll. wounded in Iwo Jima. Your personal account of Highclere’s part in the wars seems to bring our two countries closer together. Thank you. 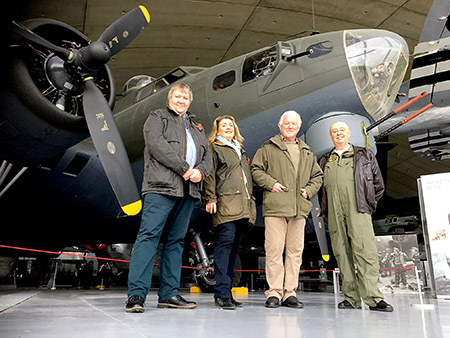 My words are an understatement to how Proud & Honoured I feel, to be part of this wonderful journey into this World War Two aircraft and its crews and their family history. I admire and thank you for your eloquence and depth of feeling, which is, sadly, much more than some so-called world leaders can muster. A very nice tribute to the men of the Fort Worth Jail House and all the others who made the ultimate sacrifice for our future. Thank you! I do have one correction, though: the author of the quote attributed to William Dutton was actually a man named John Collon, and he was speaking of Lt. Duffy, the navigator on the FWJH. Lt. Duffy graduated from High School in Brooklyn in 1941 along with my father and with John Collon. All three kept in touch during the war; John worked at the American Legation in Cairo, and my father served in both the European and Pacific theaters. When he received the news about Lt. Duffy’s death, John Collon was VERY distraught, and wrote a moving letter to my father (which includes the quote mentioned). In fact, Mr. Collon was so affected by Lt. Duffy’s death, that he ended up taking care of Lt. Duffy’s mother, Jane, for many years, even though they were no relation to one another. Jane Duffy’s husband, who had been in poor health, died only a few months after Lt Duffy; this left her a widow with no children. Mr. Collon started taking care of Jane sometime in the late 1940’s, and they were still together (as friends only) when Mr. Collon died in 1986. Jane died in 1989, and John Collon is buried in the Duffy family plot in Brooklyn along with Jane, her husband and Lt. Duffy. At the 11th hour, on the 11th day, of the 11th month: we remember those who served. How fitting to remember always and not just one day in a year. 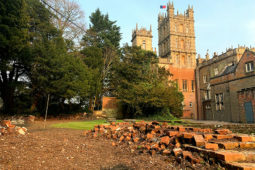 Your writings and events at Highclere keep that history alive, and it is so inspiring. Thank you for this special blog of remembrance! Once again, your words brought me to tears. It seems as I get older, I appreciate more and more how brave my Father and all of the soldiers, sailors and aviators who fought for freedom in the world wars had to be. I wish I had the gift to express in words how this moves me. 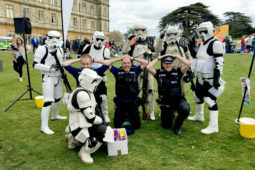 Being at the Heroes at Highclere event this year, we met the family of one of the deceased men who crashed on the estate. It struck me how this event has united those who otherwise would never have met. They saw the picture of my Father that I had on my scooter, and we shared a few brief moments of camaraderie, united by our shared losses. My Dad was crew on a B 17. I wish I could see one up close. The one that flew over Highclere moved me beyond words. I could just see my very young, handsome Father in the top turret of that big plane, looking out to see if the enemy was threatening. Wow. It is humbling. I bought a poppy pin while we were in England in September. I wore my beautiful Poppy pin to every Veterans Day event we went to, including a Parade in a neighboring town last Saturday. I learned that there is a proper way to wear the pin. The colors are symbolic, of course. The red is for the blood that was spilled, the black center is for the grief when one is killed, the green leaf is for the green grass that grows over the graves. The Leaf is to be worn at the 11 o’clock position to mark 11/11/11. I love that it all has meaning. Thank you for caring so much. I agree with what another person said, we were made so welcome by everyone at the event. It was a very special experience. So thankful we could be there. We had a beautiful service in the church at Highclere last Sunday. I am very conscious of the Roll of honour from the First World War now framed and in the Castle. In the evening were fortunate to be in Westminster Abbey for a very moving service. For the Uk charities such as the Royal British Legion and SSAFA I hoped Heroes in September was a staging post for them to use as they would.. Such a beautiful memorial for Veterans Day! I am overwhelmed by it all! My oldest grandson is in the Air Force now, immediately following college graduation! I will send this to him now! Thank you again for such a loving tribute. Your willingness to share your journey with an international audience and acknowledge the stories we have is exceptional. It’s so wonderful to know the connections being formed within the domain you’ve created touch people so deeply. My tears have been flowing because of the stories. Thank you again. The Cedar memorial is beautiful and very touching. It was interesting to know that at the Portland stone wall includes the name of Glenn Miller, the band leader. Thank you for the amazing story and the history behind it. Lady Carnarvon, I see your hand on Bob Sprout’s cross in Cambridge, my 3 children’s grandpa, Randy’s father who he never met, & I cannot thank you enough for what you are doing for the memories of these airmen. You are a very special lady & I will never forget meeting you in September & opening your home to all of us! God Bless You! The work you do in preserving the memory of those who gave of themselves so freely, is a wonderful example for us all. God bless and keep you. Lovely and beautifully written as always. THESE ARE SOME OF THE VERSES OF THE BRAZILIAN NATIONAL ANTHEM. THE PEOPLE OF MY COUNTRY DO NOT KNOW WARS NEVER IN OUR HISTORY WE HAVE ANY. EXCEPT FOR THE INDENPENDENCE OF PORTUGAL. THAT IS WHY TODAY I SYMPATHIZE WITH ALL THE NATIONS THAT I HAVE HAD .YOURS LOST YOUTH. WARS SHOULD NOT EXIST. “AND REMEMBERED THE FUTILITY OF WAR “BEAUTIFUL WORDS LADY CARNARVON. As an American, your words ring special thoughts in my mind. I remember my first trip to the D-Day Beaches in Normandy and the visit to the American Cemetery at Colleville-sur-Mer with my father. Due to physical limitations, he was never able to serve and felt this lack most deeply. While at the cemetery we both felt the spirit of those who died to preserve our freedom. A very eerie feeling but I do believe there are ghosts there. Another thought in these days of nationalistic rhetoric…to paraphrase Emmanuel Macron “Nationalism is the opposite of Patriotism.” I hope people this Veteran’s Day remember those words so that what happened during WW II and all other wars will never ever happen again. It is not enough to just be grateful. We must work to ensure there won’t be more wars so young men and women will be able to grow old instead of being killed in their prime fighting evil. That would be a true tribute to those who gave their all. I always feel it such a delight when I have received ‘mail’ from you. Your blog’s are so descriptive and I nearly feel present in the time and place you are representing with your pen. Thank you for sharing some slices of history, and giving us all the true feeling that we were there. I will be in Paris and London in May 2019. 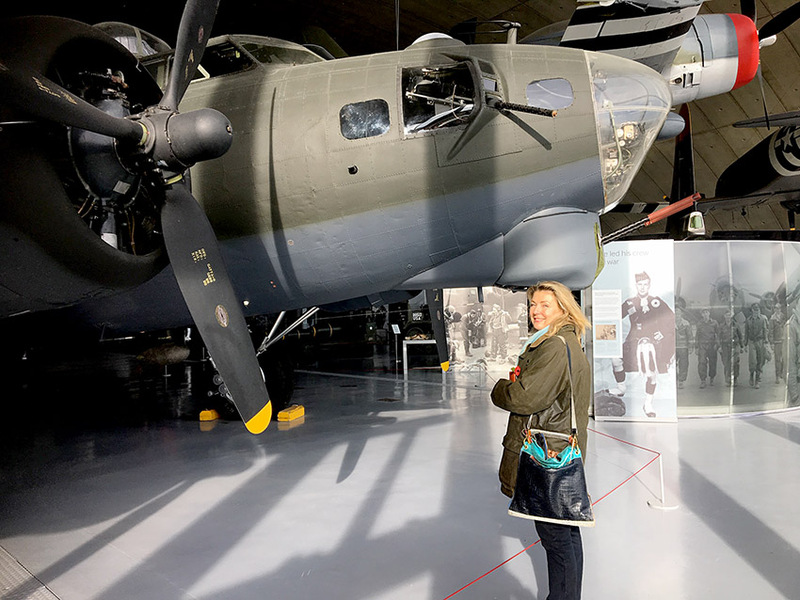 There are many D-Day Tours from America, and my husband and I are looking forward to being part of the trip and the history.